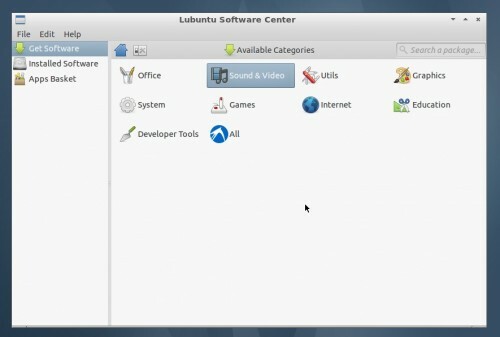 Progress Continues On 'Lubuntu Software Center'; Here's How To Install It - OMG! Ubuntu! Lubuntu currently relies users finding and installing applications via Synaptic Package Manager. The flaw with this approach is that Synaptic is an advanced tool with a powerful set of package management features and not something your�average�user should be poking around with whilst in pursuit�of a lightweight�Texas Hold ’em app. With this in mind, work on creating a user-friendly ‘Software Centre‘ for Lubuntu began. Any modern user-orientated operating system worth its salt comes with some form of�Software Centre/App Store/Marketplace. So�ubiquitous are ‘App Store’ models becoming that I’m surprised their tropes (familiar�features) haven’t found their way into every day life. Imagine trying to buy a cup of tea only to be presented with the option of choosing between the free one (with ads), the donate one (with no ads, but no sugar either) or the premium one with everything – sugar, milk, cream, honey,�sweetener, �teabag, water, cup, saucer and a 50p off next purchase coupon! Joking aside, ‘App stores’ are good: they provide a centralised, consistent and easy way to try out new software. It’s unlikely that I, as a user, would have found half of the software I use on a daily basis had it not been for the casual browsing of�App Sto..Marketpla.. er… whatever it’s legal to call them. 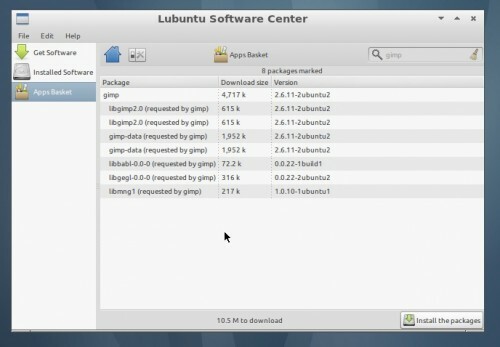 Although Lubuntu’s app hub is still ‘a work in progress‘ and under active development by its creator Stephen Smally,�the general look and behaviour of the store is already clear to see. The usual�gamut of ‘App Store’ features are present: you can browse/search for applications by name or category; learn more about the ones you’re interested in by clicking on them; install or uninstall apps with a few clicks; etc. Installation of applications works a little differently than the Ubuntu Software Centre: when wishing to install an app you must first add it to the ‘Apps Basket’. You can add as many applications as you like to your basket before installing them. When you’re ready to install your selected app(s) you just click on the ‘Apps Basket’ item on the left-hand pane. From here you can review your choice(s) (and the relevant/extra dependencies to be pulled in) before agreeing to install. Although the ‘Apps basket’ method might be a few too many clicks for some I find the approach/metaphor is very akin to real life: I’ve often put ‘things’ (read: vegetables) in my shopping trolley that I’ve then decided not to buy (read: dumped them in the cereal aisle). 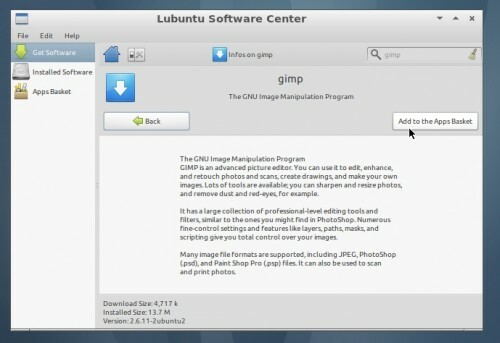 In a similar vein the Lubuntu Software Centre lets me renege on a decision before ‘check out’. To install, add the ‘Lubuntu Desktop’ PPA to your Software Sources and install the ‘lubuntu-software-center‘ package from Synaptic or the command line.